Divergent is a 2014 American science fiction action film directed by Neil Burger, based on the novel of the same name by Veronica Roth. 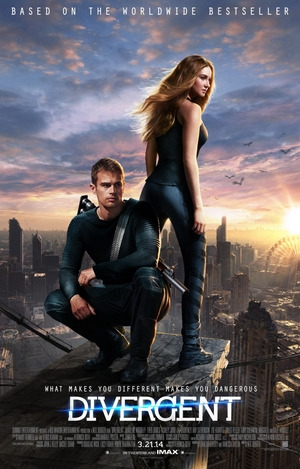 The film is the first installment in the Divergent film series and was produced by Lucy Fisher, Pouya Shabazian, and Douglas Wick, with a screenplay by Evan Daugherty and Vanessa Taylor. It stars Shailene Woodley, Theo James, Zoë Kravitz, Ansel Elgort, Maggie Q, Jai Courtney, Miles Teller, and Kate Winslet. I seem to notice that these days, as long as you do not have any high expectations of a movie, it will superseded your expectations and the movie will be not as bad as you imagined. The movie exists in a world where people are ‘pre-destined’: the selfless go to Abnegation; Amity are peaceful and hardworking; Candor, who are lawyer-like, are the truthful; Erudite are intelligent; and Dauntless are the brave (reckless) ones. If you really think about it, this world, unlike its Hunger Games counterpart, is not that realistic. Truthful? Really… there is no such thing and don’t get me on the selfless part, no one in this world (let alone a story) is truly selfless. As humans, we have a bit of everything, but most importantly we have to choice (i.e. tell the truth, help a person in need, be brave and do something daring etc…). Yes, genes and personally may make us more propelled to make certain decisions and make us more suited for a certain type of job, but we have the choice, the choice to break out of a certain mould – that individualistic characteristics that makes us so uniquely us. So this movie tells us that people in this world are fragments of what really is (in the real world) and are divided into these 4 groups, anyone not fitting in (i.e. more individualistic) are faction-less (e.g. the homeless). Divergent is an anomaly that is highly rejected and known individuals with this trait are (supposedly) killed. It is all in the genes this movie (and its novels') says… and the law of gene selection as time goes by… It is actually revealed (in the later book series) that divergents are not actually killed but recruited to be part of the government that oversees the factions, staying hidden away and working from the shadows. Divergents, are in fact, the true superior race and are selected to govern them all. Even among the divergents there are anomalies, imperfect beings whose genes are damaged in some way, hence they are not ‘pure’ and are persecuted. Though I can relate to the parallels, like how those who don’t conform society’s norm may be persecuted, or how governments like to have to control the people (to an extent), the part where it’s about genes - the progression or regression of it – does not really make that much of sense to me. Sans the background storyline (Hunger Games is much more realistic), and the lack of any real lab/scientist gene manipulation on part of the ‘government’ (which would have made this universe more believable), the characters really bought the show together. Tris shows her growth and development of becoming a Dauntless and how she overcomes her odds to succeed in a harsh environment. Not the mention the crazy tests that she takes just to get into Dauntless and the prejudice she faces for not being born Dauntless. The action is also another good point of the movie. No ‘real’ special effects were used; it was just plain old simple gun and fight scenes, with a couple of explosions here and there. The attraction between the two main leads were evident and had chemistry, something it’s teenage demographic would appreciate. So just for the acting and the fight scenes with emotions put in, I would give it a 4/5. If it were with the plot and the back-story (which I cannot really accept)… I would have to give it a 3/5.